It was June 2004 when 34-year-old Bill Busch had much to celebrate. He had just been awarded a BOLI (Best of Long Island) for his painting of NY Philharmonic Concerts in the Parks. 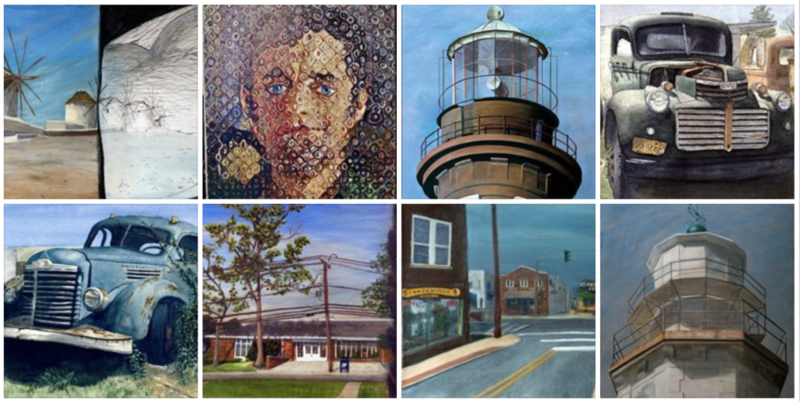 His paintings were vibrant and detailed of the lighthouses and the places he’d visited. Then, on June 21, 2004, he developed a severe headache. He began to slur his words and eventually was unable to communicate at all. He was brought to the ER, where it was determined he had a “bleed in the brain,” which caused his brain to swell and press down on the brain stem. He was given a 1% chance to survive. A radical surgery at that time was performed, removing the left side of his skull and placing it in his abdomen. This allowed the brain to swell out and alleviate pressure on the brain stem. It was the only chance Bill had to survive. He was young and healthy and it would take a true miracle for Bill’s life to be spared. He lost peripheral vision in both eyes, was unable to read, spell or count, and lost his ability to walk or use his right arm or leg. He could not say words or sentences. He was trapped in a body that was fully cognizant of the world around him, but unable to communicate verbally. His story does not end there. Bill has returned to painting and has taken on a new grid work style of painting, inspired by his favorite artist Chuck Close. He paints with his non-dominant (left) hand due to his right side remaining weak and numb. He is still unable to see anything on the right side and some of his current paintings reflect the blackness that he sees on his right side. His verbal skills have improved although he still suffers from expressive aphasia (inability to express words). Aphasia affects communication, NOT intelligence. Each year Bill takes part in a local art show and draws crowds with his paintings. He has far exceeded the doctors’ expectations and inspires others to thrive in spite of his many challenges, using his humor and determination. He reminds people that he is the “1%”. His fierce determination inspires others to never give up on their dreams and goals, no matter what obstacles they may face. Bill has been an inspiration in the community with paintings in local offices, personal homes and a local hospital in the Neuro Department. Bill has many prints available on canvas and greeting cards. Bill does community presentations as well to support the advocacy of the arts and traumatic brain injuries. Contact 631-793-4311 for more information.